No BBQ menu is complete without a shredded meat sandwich... but do you have the tools? This pair of tools easily shreds chicken, pork, beef brisket and more. 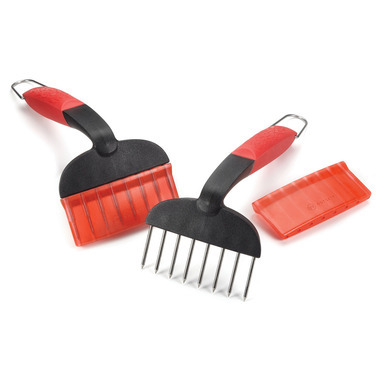 The polypropylene & TPR soft-grip handle and professional grade 304 stainless steel tines are dishwasher-safe. Equipped with a cover for protection and safe storage. These meat pullers work very well but require quite a bit of "muscle" to get the job done. We did try them on cold meat which likely added to the effort. However, I think they would work much better on meat fresh out of the oven or off the barbeque when it is still hot and "fall apart" tender. They are very sturdy and well made.